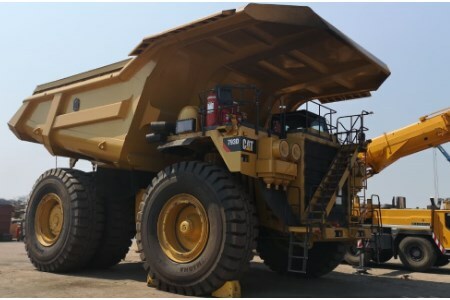 One of the largest mining contractors in the world operating in Africa’s largest coal mine selected 40.00R57 Magna MA04+C GIANTS for their CAT793D rigid dump trucks. Outstanding tyres are essential for the transport of huge amounts of coal to cover the total haul distance from the pit to the dump area without any downtime or failures. Due to Magna’s proven track record regarding premium quality giant tyres, this client has decided to work with Magna and now benefits from increased productivity and reduced operating costs. The all steel radial constructed tyres especially designed for coal applications are extremely suitable for the severe conditions in which they are used. The deep aggressive E4 tread pattern and excellent resistance to sidewall damages makes this GIANT tyres extremely durable. As part of Magna’s added value a site visit was organised including an application analyse and quality check on current running MA04+ tyres. This check has shown an impressive toughness and efficiency which will result in a reduction in costs per hour to operate the trucks. In addition, recommendations on compound for other dump trucks from their mining fleet have been given in order to provide this client with the best suitable Giant Magna’s in the near future. The company is pleasantly looking forward to the completion of the site check and continue to work in close collaboration with this mining contractor.